By opposing the direction of the outer and inner layers, this wire rope joins our non-rotating line up. It also measures just 10mm thick and has an 18×7 configuration of strands, allowing for an abrasion-resistant surface to sit amongst its list of perks. An ability to counteract unwanted rotation during use is clearly the main benefit of this rope, but there are a lot of other things worth discussing in relation to its design. 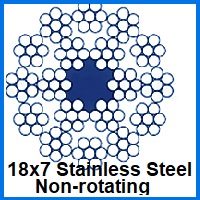 The use of stainless steel singles it out as suitable for marine use, as well as outdoor lifting of all kinds. You can find sturdier stainless steel rope in our range, but this 10mm diameter product still packs a decent 5,253kg working load limit. factor in its 51.5kN breaking force rating and you have a compelling option that weighs in at just 0.4kg per meter of length. You can take any wire rope we make and request a custom assembly, made for you by our engineering team using the latest techniques and the highest quality fittings. You can also order a simple length of 18×7 non rotating rope and also snap up handy tools that can be used to alter it as necessary. To get assistance, information and quotes for wire rope, email our team at your convenience. It is also possible to call us on 01384 78004 and speak with an expert in all things wire-rope related for more details. 10mm 18x7 Non-Rotating Stainless Steel Wire Rope Overall rating: 5 out of 5 based on 6 reviews.